(Bloomberg) -- An aging leader steps down as president but keeps a firm grip on the reins of power. For many in the Kremlin, the choreographed events unfolding in neighboring Kazakhstan are a model for Russian President Vladimir Putin to consider. 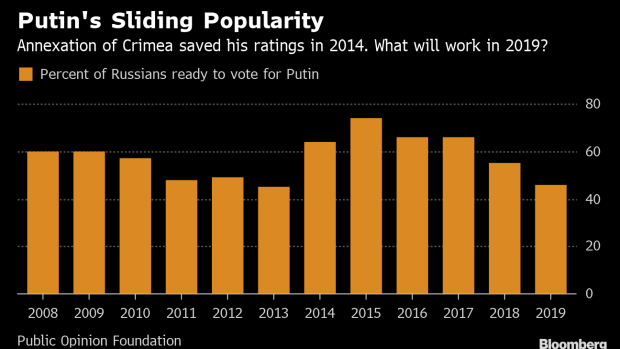 Unlike his Kazakh counterpart Nursultan Nazarbayev, however, nobody’s certain Putin could pull off a transfer of power without triggering destabilizing infighting among rival Kremlin camps that currently is held in check by his rule. The political and personal risks to Putin are high. A transition similar to the one under way in Kazakhstan has been actively discussed in Moscow, said Andrei Kolyadin, a former presidential administration official who now works as a political consultant for the Kremlin. “The Nazarbayev scenario could suit the political elite, which wants to have an arbiter who can influence the process after the successor takes over,” he said. Some within the ruling elite are pressing the Russian leader to remain president for as long as possible, three people close to the Kremlin said, asking not to identified discussing internal matters. Options being explored include pressing neighboring Belarus into uniting with Russia to create a new state so that Putin can sidestep constitutional term limits. There’s no agreed scenario for a transition, the people said. The election of Nazarbayev’s eldest child, Dariga, as the Kazakh Senate’s new chairwoman on Wednesday, putting her first in the line of succession to the presidency under the constitution, is an example Putin has signaled he’s unlikely to follow with his own daughters.